Rock musicians Jerry Cantrell and Duff McKagan toured Europe in the fall, but the Seattle lifers made sure the party was on whenever the Seahawks played. Duff McKagan, along with fellow Seattle rock star Jerry Cantrell, are off to the Big Apple to hail their favorite team in the Super Bowl. It was almost 11 a.m. and the party on the tour bus was in full roar. Two veterans of the rock and roll highway held court, traded barbs, and laughed as they passed time between shows on a tour. Care had been taken to make sure both had exactly what he wanted for the party. The atmosphere on board was festive and loose. But if an outsider stuck his head in the door to see what all the noise was about, he might have been surprised. Because it wasn’t 11 p.m. but 11 a.m, the usual accoutrements one might associate with rock and roll debauchery were nowhere to be found. This was 2013, not 1993. The party on Alice in Chains guitarist Jerry Cantrell’s tour bus was to celebrate the opening day of the NFL season, which happened to fall in the middle of the Uproar Tour. Joining Cantrell on his bus was fellow Seattle native, Seahawks fan, and Uproar tour mate Duff McKagan from Walking Papers. The duo powered through cups of coffee and plates of fresh fruit. Or, at least one of them did. “Jerry eats like a 15-year-old,” McKagan said. “Oreos and pretzels. That’s the stuff he eats.” McKagan laughed when it was pointed out that had this party taken place in 1993, the scene on the bus would have been different, likely involving more than Oreos and pretzels. McKagan and Cantrell are attending Super Bowl XLVIII together, which is appropriate because they watched so many games this season as their bands crossed America and Europe playing live shows. The NFL Network has a feature on the pair that will air Monday morning. The Seahawks have been part of the adventure for McKagan since he was a kid. “My Gil Dobie Little League football team played a game at halftime of a Hawks game at the Kingdome,” he said. A 12-year-old, he was a defensive end and linebacker on a team that made up for a lack of size with a tough attitude. One of McKagan’s teammates at the time was Hugh Millen. It’s possible that during a Gil Dobie league practice in 1976, a 12-year-old Millen was discussing strengths and weaknesses of the 3-4 defense compared to the 4-3 defense, while 12-year-old Duff McKagan was working out the chords to “Welcome to the Jungle” in his head. 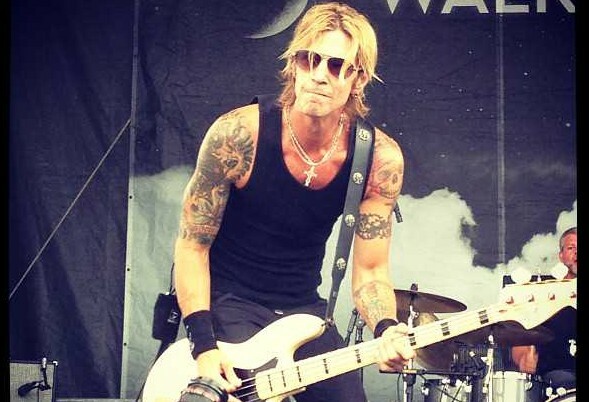 Millen would go on to a football scholarship at the University of Washington and 11 years in the NFL, while McKagan made the major leagues of rock with Guns N Roses, where his life went almost off the rails in the early ’90s. During that time, he said the Seahawks often provided him with a small light at the end of a dark tunnel in which he was stuck. McKagan and Cantrell met in 1989 and have been friends since. They beat the demons of alcohol and drugs that tend to stalk young musicians, and focus much of their attention these days on football. For several years, Cantrell has organized a rock-star fantasy football league. Members besides McKagan include Cantrell’s AIC band mate Mike Inez, Pearl Jam’s Mike McCready, Scott Ian of Anthrax, guitarist Zakk Wylde and Kid Rock, among others. The league is set up as a charity fundraiser with all fees going into a pot that is distributed to the winner’s favorite charity. McKagan says he’s in the league mainly for the charity component and views the entire process with bemused indifference. The pair was in Detroit in 2006 for Super Bowl XL. It’s a trip best remembered by McKagan for a disturbing revelation at the start of the journey. They met at the airport to fly together. McKagan was there first when he spotted Cantrell walking toward him. The NFL has done research that concludes most people pick a favorite pro football team before turning 10. Cantrell was born in 1966, before the Seahawks existed. He liked the Steelers. When the Hawks arrived in 1976 he liked them, too, but never saw a reason to abandon his first love. McKagan was unimpressed. Welcome to the Jungle~albeit the Cosmopolitan Jungle known as Jersey…..